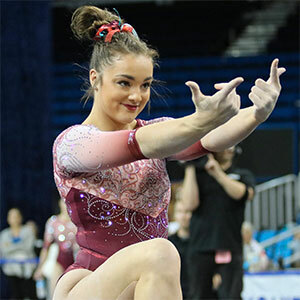 ST. LOUIS, April 19, 2018 – Led by 2015 World team gold medalist Maggie Nichols, the University of Oklahoma Sooners seek their third-straight and fourth overall National Collegiate Women’s Gymnastics Championships team title this weekend at Saint Louis University’s Chaifetz Arena. Fans can catch all the action live on the networks of ESPN and online at WatchESPN.com. Olympic medalists and ESPN gymnastics analysts Bart Conner and Kathy Johnson Clarke are calling the action on ESPN2 and ESPNU, with Laura Rutledge handling reporting duties on the telecasts. New to this year’s coverage, ESPN will feature commentary on each apparatus stream on ESPN3 and the ESPN App for a unique second-screen offering surrounding the championship. 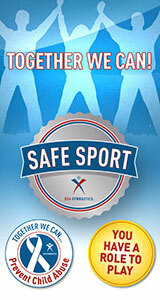 2008 Olympic teammates Alicia Sacramone Quinn (vault) and Bridget Sloan (bars), SEC Network gymnastics analyst Lauren Sisler (beam) and three-time Olympian John Roethlisberger (floor) will provide analysis for their respective events, in addition to the return of ESPN3’s all-around stream. Twelve teams will vie for team, all-around and individual event titles with two national semifinals scheduled for Friday, April 20. The Super Six finals are set for Saturday at 7 p.m. ET. The semifinals determine not only the six teams that will vie for the national title Saturday evening but also the all-around and individual event champions. The teams in the first semifinal scheduled for 1 p.m. ET are the University of Alabama, the University of Arkansas, the University of Georgia, Louisiana State University, the University of Nebraska and the University of California-Los Angeles. The second semifinal starts at 7 p.m. ET with the University of California-Berkeley, the University of Florida, the University of Kentucky, Oklahoma, the University of Utah, and the University of Washington. Seven women in the field helped Team USA to gold at the World Championships: Alyssa Baumann, Florida; Maddie Desch, Alabama; Brenna Dowell, Oklahoma; Madison Kocian, UCLA; Nichols; MyKayla Skinner, Utah; Kyla Ross, UCLA; and Sabrina Vega, Georgia. Kocian and Ross are the first Olympic gold medalists to compete in the NCAA ranks, while LSU’s Sarah Finnegan and Stanford’s Elizabeth Price, who qualified as an individual all-around competitor, were both alternates to the 2012 U.S. Olympic team. The complete broadcast schedule for the National Collegiate Women’s Gymnastics Championships is below.